A person bikes in Bogota, Columbia, during the city’s car-free week. The city’s car-free streets simultaneously promote social equality, a vibrant economy, and a sustainable environment. Photo by M.Erwert/Flickr. Mayor Enrique Peñalosa organized the first car free day for Bogotá, Colombia in 2000 and proposed a ballot poll in which it was approved permanently. Mejor en Bici (Better on bike) was one of the many organizations upholding the mayor’s promise to annually provide a car-free day. 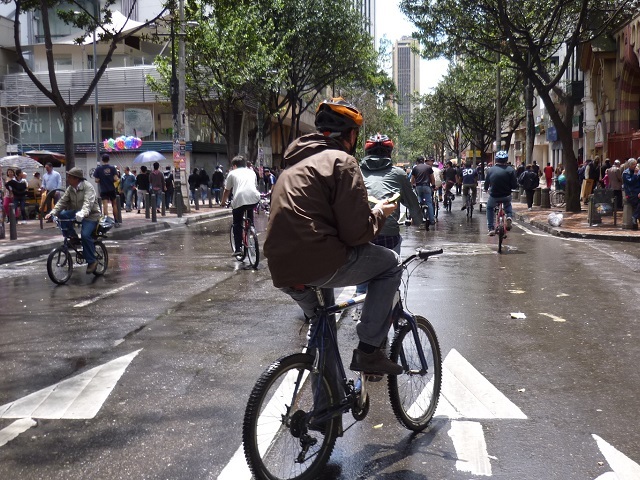 Now, Mejor en Bici has gone even further with the help of the city of Bogotá to prolong this “car-free” day to an entire week, extending from February 6th to February 13th. This weeklong extension shows that Bogotá’s bicycling infrastructure is strong enough to where the economy’s vibrancy does not have to be compromised for the country’s sustainability initiatives. Other developing countries should follow Bogotá’s example and seek out ways in which sustainable transport can simultaneously help economic, health, and development goals. Bogotá’s car-free week has been possible only with the support of many parties, such as the Sura, Pacific Rubiales, Universidad Javeriana, Equión, Unilever, Diageo and Bolivar Insurance companies. Each party hopes this car-free week will accomplish something different: insurance companies see the push towards a car-free city as a way of saving lives; energy companies see bicycling as a way to save valuable finite fuel resources for critical uses; universities see a car-free city as a living example of how ecological thinking can make real-world impacts. According to one Colombian newspaper, residents of Bogotá lose approximately 22 days per year in traffic. These residents also lost 570 people to traffic fatalities in 2013. Although the city has made great strides in economic development, the loss in life that this economic growth has come with has been harsh. This car-free week is a turning point for Bogotá’s residents that it is time to start gaining—gaining time back from sitting in traffic, better air quality, and happier and longer lives. “It is proven that bicycling makes people feel happier and, above all, improves your income, because when you ride, you lose less time in traffic and less money,” emphasizes Diego Ospina Casto, Mejor en Bici manager. 376 km (233 miles) of bike paths are open for the event this week. The municipality of Bogotá hopes that next year, there will be even more extensive bike paths available. Many other cities around the world, such as Abuja, Nigeria, and Jakarta, Indonesia, who are facing the impacts of rapid urbanization, can learn from Bogotá how sustainable transport can be used as to holistically tackle environmental, health, and development goals. This post was inspired by the blog “Bogotá terá uma semana sem carro” on TheCityFixBrasil.com.